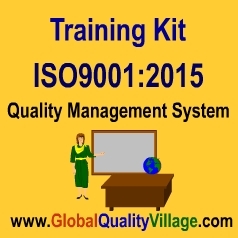 If you plan to implement ISO9001:2015 quality management system in your organization, you need to impart company-wide training on ISO9001:2015 concepts and requirements. If your company is already certified to ISO9001:2015, there is still a need for imparting training to the new recruits. To learn the steps involved in design, implementation and ISO9001:2015 certification of a company's QMS. What is ISO, what is ISO9001:2015, who issues ISO9001:2015 certificate, Gantt chart of a typical ISO9001:2015 implementation project, etc. Note: As the older edition of the standard (ISO9001:2008) is still in force, we shall give the ISO0001:2008 QMS Training Kit FREE OF COST to the buyers of our ISO9001:2015 QMS Training Kit.